Chennai on alert – it is raining now, though not heavily ! – a cyclone, that is steadily moving in west-northwest direction towards the Tamil Nadu coast. The system is expected to cross the south of Puducherry near Cuddalore by the early morning hours of December 2. பெயர் சூட்டும் நடைமுறைக்கு பிறகு உருவாகியுள்ள 45வது புயல், 2.12.16 அதிகாலை தமிழகத்தை கரையை கடக்க போகும் நாடா ஆகும். ஒரே சமயத்தில் இரண்டு பகுதிகளில் ஏற்படும் புயல் சின்னங்களை வேறுபடுத்திக் காட்ட புயல் சின்னங்களுக்கு பெயர் சூட்டும் முறை அறிமுகம் செய்யப்பட்டது. லத்தினை பூர்வீகமாக கொண்ட இந்த வார்த்தைக்கு, ஒன்றுமில்லை (nothing)என்று பொருளாகும். Going by media reports, a cyclonic storm named Nada has been building up in the Bay of Bengal and is expected to cross the Tamil Nadu coast on Friday, December 2, the Met department has said. It is expected make landfall close to Cuddalore, around 185 km from Chennai, between Vedaranyam in Tamil Nadu and Puducherry, it states. Currently, the cyclone is about 710 km south-east of the Tamil Nadu capital and is expected to move west and intensify. 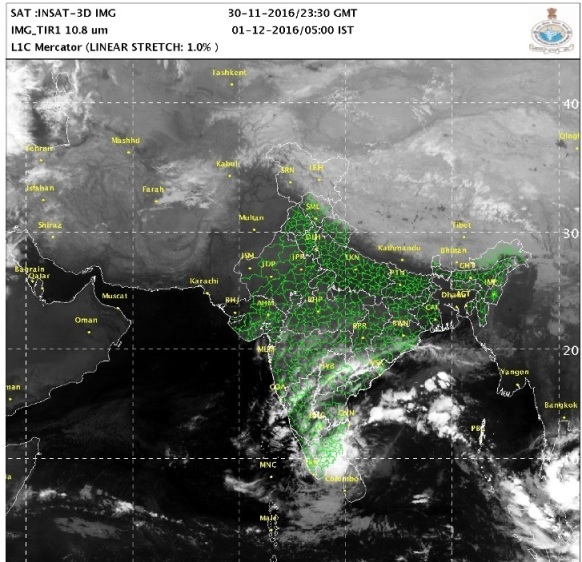 The entire south-east coast can expect heavy to moderate showers accompanied by strong winds as the depression in the Bay of Bengal nears the eastern coast. In the next 24 hours, Tamil Nadu will receive rains along the coastal parts and then it will gradually move to the inner districts. Squalls between 45 kmph to 65 kmph would commence from December 1. Chennai is expected to receive moderate rain from Wednesday night and heavy rainfall has been forecast in the northern coastal areas of Tamil Nadu and Puducherry from Thursday. 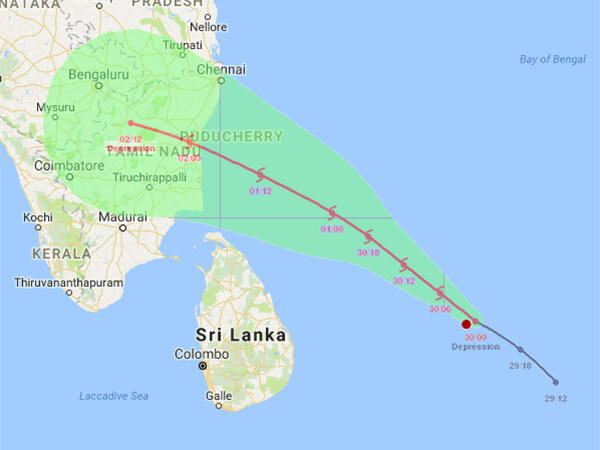 In the wake of a warning issued by the Meteorological Department about cyclone ‘Nada’ heading towards the eastern coast of Tamil Nadu, Government agencies have put in place various mechanisms to deal with its impact in northern Tamil Nadu and Puducherry. The School Education Department has announced a holiday for schools on Thursday and Friday in Chennai, Tiruvallur, Kancheepuram, Cuddalore and Nagapattinam districts and in Marakkanam and Vannur taluks in Villupuram district. Separately, the Puducherry administration has declared a two-day holiday. Anna University has announced cancellation of Thursday’s semester exams for its affiliated engineering colleges. ‘Nada’ is likely to bring widespread rains over coastal Tamil Nadu and Puducherry till Friday, S. Balachandran, Director, Area Cyclone Warning Centre in Chennai, said on Wednesday. Last year’s catastrophic floods in Chennai, which claimed hundreds of lives, was a wake-up call for authorities as they struggled to contain the situation. The floods worsened due to an exceptionally strong El Niño, along with choking of stormwater in the city, creating a national emergency prompting the NDRF, Indian Army, Navy and other security forces to carry out rescue and relief operations. The drains, some of which were constructed over the past decade, have repeatedly proved to be ineffective. Predicting future from past data is regular analysis; but some are spreading panic comparing this to Dec 2015 floods ~ while there have been so many cyclones that have threatened Chennai and parts of Tamilnadu in the past without causing anything similar to that of last year. This is what NASA says : Tropical Cyclone 04B has been renamed Tropical Cyclone Nada. On Nov. 29 at 2:24 a.m. EST (07:24 UTC) the Visible Infrared Imaging Radiometer Suite (VIIRS) instrument aboard the NASA-NOAA Suomi NPP satellite captured a visible image of Tropical Cyclone Nada east of Sri Lanka. The VIIRS image shows that clouds associated with Nada were being pushed west of the center by easterly vertical wind shear. As a result of the wind shear, the Joint Typhoon Warning Center or JTWC does not expect Nada to intensify before making landfall. Prior to 2000, there was no practice of naming cyclones in the Indian seas. However, the 1999 cyclonic storm which ripped Odisha, triggered the necessity of naming storms. The WMO (World Meteorological Organisation) envisaged a panel, comprising of members from 8 countries, to assign names to storms forming in the Indian Ocean. These countries have prepared 64 names which have been in use on a rotational basis. The names of the countries are listed alphabetically and names given by them are used sequentially column-wise. This name was suggested by Oman and the word of Latin origin reportedly means ‘nothing’.